I was not the biggest fan of the either of the ABCs of Death anthologies. I thought that some of the shorts were really good, but they were surrounded by shorts that were not so good. However, I am always looking for something new and when I saw on Dread Central that Drafthouse Pictures is releasing an ABCs of Death 2.5, I must admit that I am probably going to watch it. The kicker to this plan lies in the fact that the film is going to be available exclusively on Vimeo, a streaming service that caters more to an indie crowd than YouTube. I have tried Vimeo in the past and found their service to be lackluster. In fact, I was having a really hard time trying to get the embed of the trailer below because the website kept screwing up. Drafthouse Films has announced the upcoming release of ABC’s of Death 2 1/2: World Competition Edition, the result of an extensive global campaign intended to spotlight the most passionate and talented upcoming filmmakers in the horror genre. The latest entry in the beloved franchise will arrive exclusively on Vimeo August 2nd as a $5.99 download or $2.99 rental. The series, known for its anarchically alphabet­-themed anthology of short films, launched a “Filmmaker Frenzy” competition for the segment devoted to the letter “M” – collecting more than 500 three-minute long entries from over 40 countries in the process – including Robert Boocheck’s winning entry, “M is for Masticate,” featured in ABC’s of Death 2. ABC’s of Death 2 1/2 showcases an additional top 26 finalists, providing fans 85 minutes of unadulterated madness, including “M is for Marauder,” “M is for Malnutrition,” and “M is for Mariachi,” along with plenty more new nightmare fuel to tide them over until the next numbered segment in the series. 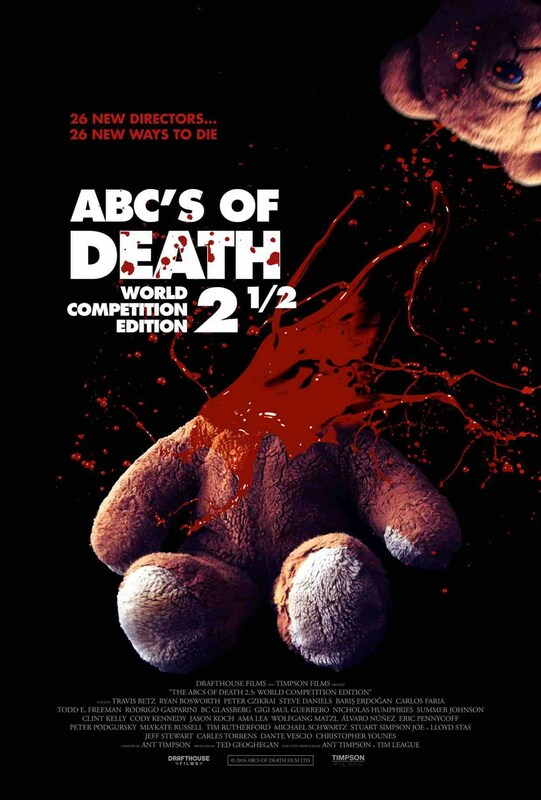 ABC's of Death 2 ½ from Drafthouse Films on Vimeo.